Have I ever told you I’m nuts about Rhubarb? Ever since I was little – we kids used to take the old blue melamine sugar bowl (this is before we got the Corelle) and sit in the shade of our honeysuckle hedge and pull rhubarb, dip it in the sugar and take a bite. And repeat. Sweet & tart. Just like this Sour Cream Rhubarb Coffee Cake. I love this Sour Cream Rhubarb Coffee Cake or any Rhubarb Coffee Cake for that matter! Coffee Cakes are just the thing to have on hand when you have a brunch or overnight guests. Or maybe just for the family. 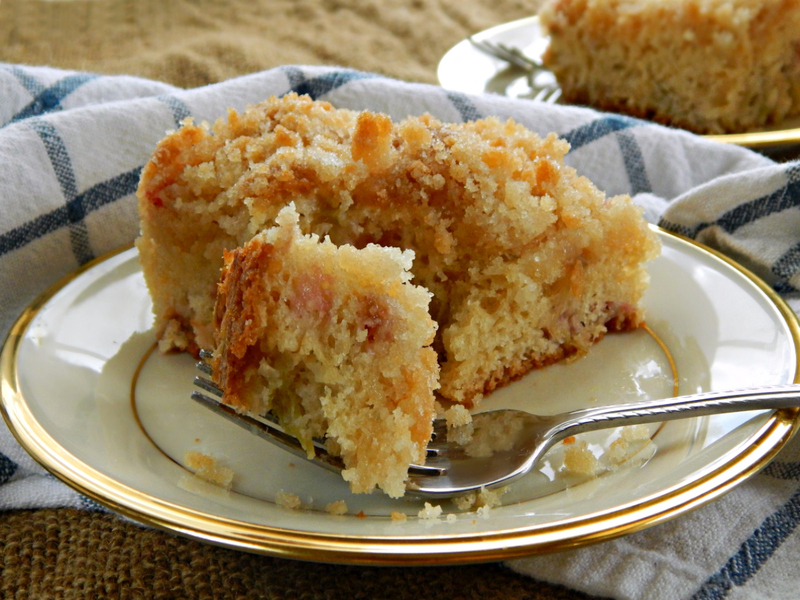 I already have a Rhubarb Coffee Cake on my blog. It’s a little delicate and has a gorgeous Vanilla Sauce. You might want to check it out, too. It’s a whole different animal from this coffee cake. Sour Cream Rhubarb Coffee Cake is super easy (no mixer needed) and is big and fluffy and supremely moist! It is a beautiful thing. Seriously, it’s outstanding. If you love cinnamon, you can add a teaspoon to the batter, but I like this just plain. I think it lets the Rhubarb flavor shine through in all its unadulterated glory. And if you’d rather use yogurt instead of sour cream, that works well, too. The streusel topping with the white sugar may not be the standard streusel we think of today. In this recipe and almost all the older Rhubarb recipes I’ve seen, white sugar is used rather than brown sugar with rhubarb. So the topping is almost just a crispy layer on the top. It complements the rhubarb flavor perfectly. The white sugar topping doesn’t get melty and gooey like a brown sugar streusel, though; the sugar stays a little grainy and crunchy. You’ll find after a day or two the topping softens up, and while it’s still delish, isn’t quite at its peak. Did I mention “mix by hand!” Yes, I did. Seriously this is going to be the easiest coffee cake you’ve ever made. You might want to think about using this as a base for other coffee cakes. Just sub out the rhubarb. This cake would be a perfect 1st project for a budding baker, too. Usually I have quite a few hints and helps when I post a recipe but in this case, there’s hardly anything to it. Ya gotta love that! Actually, I think I need more recipes like this in my life. The only thing I can think to add is if you use a frozen rhubarb, don’t thaw it, just put it in frozen. The interesting thing about this recipe is there is no butter, which is usually one of the pricier ingredients when baking. There is a good amount of sour cream, though. I make an effort to buy sour cream during the holiday sales; almost any holiday will have sour cream on special in the preceding weeks. Then I make sure to keep it clean, don’t leave it open on the counter and only dip into it with clean utensils. And store it upside down in the fridge. It makes an airtight seal. It goes without saying that picking your rhubarb, either your own or a neighbor’s is going to cost less than buying. So many people have rhubarb they don’t do anything with. It’s a shame because as the stalks are picked, more grow in. It’s like magic! If your neighbor gives you rhubarb, make sure to give them a piece of the Sour Cream Rhubarb Coffee Cake. 🙂 If you are picking or buying fresh rhubarb, you’ll need a little more than a pound because you’ll need to trim the leaves and ends off. Rhubarb comes frozen in 1 pound bags, which, depending on how it is cut, may be just slightly less than you need for this recipe. I wouldn’t sweat it, just use the pound bag. Look to see if rhubarb isn’t included when frozen berries are on sale. It’s usually not going to go on sale by itself, it’s just not popular enough. Frozen items like this are usually cheapest in late summer after harvest. Supply and demand, right? Prices will rise over winter, but look for sales around holidays. A big, fluffy, super easy (mix by hand) rhubarb coffee cake. Preheat oven to 350 degrees. Oil and flour a 9 x 13″ pan. In a small bowl, mix together the sugar and butter until smooth. Add the flour and mix until crumbs form. Set aside. In a large bowl, stir together sugar, baking soda, salt and flour. In a smaller bowl, mix eggs and sour cream until smooth, then add to the above mixture, stirring until incorporated. Fold in the rhubarb, spread into the baking pan and smooth the top with a spatula. Sprinkle with the topping. Bake about 40 to 45 minutes or until a toothpick inserted near the center comes out clean. And, as I do almost every Friday, I’ll be linking up to Angie’s Fiesta Friday – this week is Fiesta Friday 124, and the co-hosts this week are Lindy @ Love in the Kitchen and Liz @ spades, spatulas & spoons. This entry was posted in Click here for Fabulous Food Posts and tagged Breakfast or Brunch Dish, coffee cake, rhubarb, rhubarb coffee cake, Sour cream. Bookmark the permalink. Could i substitute brown sugar for topping? What ahout adding walnuts? Ok, so now I have to plant rhubarb!! And pin this so I can make it for my parents – they are huge rhubarb fans! Debbie, the rhubarb is a little more subtle than you’d guess, so I think anyone would love it, but if you love rhubarb, I KNOW you’ll love it!! My folks are big fans, too! For some reason I always thought uncooked rhubarb was poisonous. Thanks for setting me straight. We will be planting some in the garden when we move up to our cabin (if I ever retire). This looks delicious. You’re not supposed to eat the leaves – they’re poisonous! I love everything about this cake. Rhubarb is a favorite of mine and I see people just letting it go to waste. So SAD! Pinning and sharing! Mmmmm rhubarb coffee cake! Such a classic. Thanks for bringing this to Fiesta Friday! Hi Lindy, thanks for stopping by and thanks for hosting FF for us!! I just realized I hadn’t linked up properly, so I’ve fixed it! Have a great week! This rhubarb nut is drooling Mollie! I need this cake right now with my cup of tea! Looks so moist! Oooh, it would be wonderful for tea! Thanks Johanne! This looks a delicious cake to have with coffee. I haven’t tried out any rhubarb recipes, because it is hard to come by here, but your photo and recipe makes me want to try it out. Thanks for sharing this at the fiesta. Sounds great — I’ll just have to head to the market instead of rhubarb growing in a garden! Happy weekend! No Rhubarb!! Oh, my life would not be complete!! And thank you, Winnie!! I used to eat rhubarb like that as well! Your cake looks great — always on the lookout for new rhubarb recipes. Such great memories that brings back, huh? I love knowing that so many share this childhood experience! 🙂 This recipe is a keeper, btw! Oh, you should give it a try, then! I love the bit of tartness it adds to recipes. Sweet or savory! Oh this just looks divine…I can smell it from here:) yum! You can take those stringy stalks and cut down them lengthwise into smaller strips and then across into a dice. That way it won’t be too fibrous. My husband keeps saying we need to plant some rhubarb, I guess I better take him up on that! i love how simple this sounds! Yes, plant rhubarb!! It takes awhile to get established but a plant can live like almost forever!! I love those old memories! What a cool use of rhubarb! Looks delicious! It’s so good, Antonia! I might have to make a few more rhubarb recipes, yet!! I think sometimes it’s what you grow up with and in the Midwest I bet there is hardly a farm that doesn’t have rhubarb tucked away somewhere. Wow does that cake look delicious. I think I will have to get some rhubarb just so I can make it. Rhubarb and Coffee, what a great combo! This looks and sounds so yummy and topped off with a streusel topping too. So even though this is called coffee cake here in the states it doesn’t actually have coffee in it – I think the name came about for these casual cakes that are almost like a quick bread but a little softer because back in the day when the men went off to work, the wives would kick back with the neighbors and eat cakes like this and drink coffee! But yes, it is yum!! Ahhh I see, coffee cake over here has coffee in it!! I thought I didn’t see coffee in the recipe! Lol. Bet it still tasted great though. I could totally kick back with a coffee and a piece of this cake! That’s what’s great about baking and sharing recipes on blogs, you get to see how others do certain recipes. Recipes never appear to be the same and you can try out others take on cakes.